This recipe is based on the traditional recipe for “Rochers” (Rocks), which traditionally uses slivered almonds. Nuts are usually lightly dampened with stock syrup or a brandy style alcohol (kirsch) before being slowly roasted. This will help to preserve and increase the flavour of the nuts. Place thick or coarse sliced macadamia nuts into a bowl, make sure that nuts (28C +) have a temperature as close to the crystallised temperature of Couverture used (check manufacturer’s instructions). Add the tempered Couverture (check manufacturer’s instructions). Spoon small heaps on grease proof paper and leave to set. Approximately 45 pieces per recipe. Use other thick or coarse sliced nuts such as pistachios, cashew nuts, walnuts, hazelnuts, almonds etc. 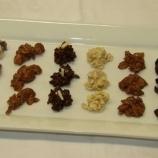 As another options combine nuts with dried fruits such as cranberries, apricots etc.